PhD students are part of the big organization that the TU/e is. During this lunch we enjoyed a talk about the Faculty Council, explaining what that entails and why it is important, followed by a combined presentation and discussion powered by the HR department. Topics of interest included career opportunities for PhD students and how HR can assist us. This turned out to be of great interest to many PhDs and so Charl Kuiters (C.M.Kuiters@tue.nl , MF 5.071a) and Corlien van Dam (C.M.v.Dam@tue.nl, MF 5.069) could answer many questions..
On March 1st we gathered with 20 people at the IJssportcentrum for a game of Bounceball! Playing soccer on the ice surrounded by a huge inflated ball proved to be very amusing for both participants and spectators. Four teams competed for golden medal and after five exciting games the team consisting of Thomas, Rick, Arthur, Ulyana and Thom was crowned the winner. After a long and tiring day of research, a good way to relax is having a drink, maybe at a pub. A better way to relax is to do that with friends and colleagues. An even better way is doing that while participating in a pub quiz. The latter is exactly what about 30 PhD students did during our Social Event in February. The common room at the fourth floor of MF served as a pub where the participants competed for the secret price while enjoying some snacks and drinks. Quiz master Jorn humorously tortured everyone's brains with random trivia and music questions. After a night full of fun our PhD students can now tell a movie from a still, solve anagrams to get a song title and can list James Bond movies of which the title consists of a single word only. What more can you expect of a researcher? In academia it is not only important to acquire new knowledge but also to convey this knowledge to others. During your PhD you may have to teach, give an informal presentation to your colleagues or even present your work at a conference. About 30 PhD students learned the ins and outs, sharing their knowledge using (technical) presentations during our latest workshop on presenting. Two trainers from Elroy com, a company which specializes in presentation trainings for a scientific audience taught us the ins and outs of giving a scientific presentation. Not only did we discuss what to put on slides - and what to leave out. We also learned how you can use your voice and what influence body language and attitude have on your audience. As part of the training, PhD students gave short presentations about their own research to others in small groups. This was not only good for getting feedback, but also inadvertently served as a team building activity. On December 12, the PhD Council hosted the first-ever PhD Christmas Party! Over 50 PhD candidates and partners gathered at the Temporary Art Centre, to enjoy a three-course Christmas dinner together. The remainder of the evening was kicked off by Chinese dance group "XYZ" with an act about magical dolls that come to life at night to dance. Much like these dolls, the guests danced the night away to the tunes of DJ Vanance. On the 27th of November we had a lunch with companies event. More than 50 fellow PhD students participated in the event. It was both fun and informative. The two speakers were Martijn Rutten and Remo Minero. Martijn is the CEO of Vector Fabrics, which started as a Spin-Off and specializes in development and testing tools for complex software that is used in embedded systems, including automotive, IOT devices, medical and industrial systems, and more. Remo is a Quantitave Analyst at the NN group which is an insurance and investment management company active in more than 18 countries, with a strong presence in a number of European countries and Japan. Previously Remo worked as VP of RBS International Banking. PhD students bringing theory into practice. "You will not get what you deserve, you will get what you negotiate." With these inspiring words, Serge van Rooij and Willemijn Smeets from Bex* Training & Coaching kicked off our latest workshop. This time, we learned about the dos and don'ts of negotiation. Negotiation can be found everywhere in society, ranging from salary negotiations, to negotiations with your supervisor about which conference to attend, to discussing with your s.o. the destination of your upcoming holiday. Almost 30 PhD students attended the workshop. 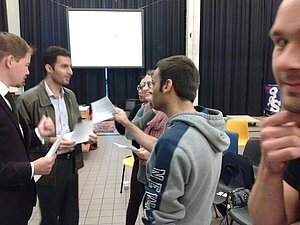 We learned about common pitfalls, the impact of body language, and techniques to get the most out of any negotiation. We then brought the theory into practice in the Great Negotiation Game. This lunch had two topics: informing the PhD's about confidential advisors and research grants. From the department DPO (Personell and Organisation), two confidential advisors were present: Tineke van den Bosch-Doreleijers and Judith Beenhakker. They explained their roles within the university, specifically focussed on the PhD's: helping with work-related psychosocial stress. When you are facing stress or discomfort related to work itself or social pressure at work they are the ones to contactaa. Secondly, Jacques Resing, confidential advisor of the Department of Mathematics and Computer Science was also present at the lunch and the explained his role in addition to the confidential advisors of DPO. Jacques Resing is the first person to contact when you have e.g. problems with your supervisors, collegues etc. It is also worth to note that you can contact the confidential advisors for any problem, and they will help you find the correct contacts to further deal or solve the problem. Anything you tell the confidential advisors is, by definition, confidential and will not be shared with anyone else without your permission. For the second topic of the lunch - Grants - Connie Cantrijn from the office of research grants was present to explain personal grants for PhD students. There are several grants that a graduated PhD student can apply for with different odds of succes. The grants serve different purposes and have several requirements, think of recommendation letters, extended CV's, well-formulated research plans etc. For more information and help with filing a request for grants, please contact Connie Cantrijn.In short: this lunch provided a lot of usefull information for both fresh-started PhDs as well as about-to-graduate PhDs. [Translate to Engels:] This lunch had two topics: informing the PhD's about confidential advisors and research grants.